A targeted, intuitive experience for users to help them find the right space for important life events. McMenamins is a Pacific Northwest-based chain of brewpubs, microbreweries, music venues, historic hotels, and theaters. Their web application includes everything from food menus to hotel reservations, event listings to movie tickets. With 53 properties in Oregon and Washington – ranging from a library at a former elementary school to an outdoor amphitheater at a remodeled church – hosting events is an important part of their business. But utilizing their online request form was a challenge for users, and the site lacked room for inspiration and exploration. As our team reviewed the site and user workflow, we realized that the existing navigation was a challenge. The site relied on a side navigation that assumed a user knew exactly what property they wanted. This prevented exploration. Rather than force the user to choose one property from the get go, we wanted to open the door to all of them. But we needed to know: What information do users need? How are they making their decisions? What would help them achieve those goals? After finding out the answers, we approached McMenamins with a simple three step process. First, the “Host an Event” homepage would be a starting point with quick links. 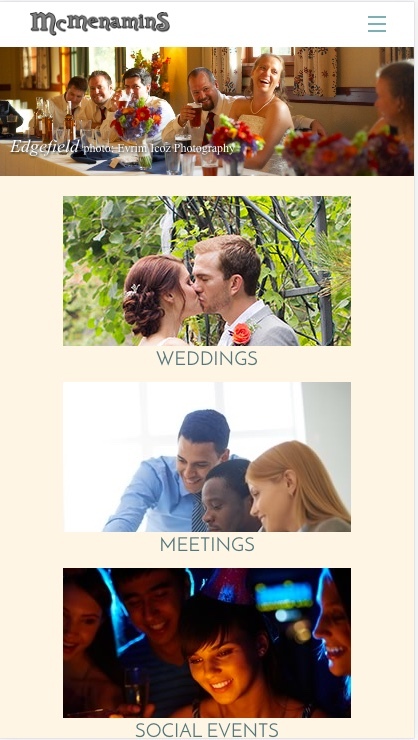 From there the user could select the type of event they would like to have (a wedding, for example) and be transported to a page where they could browse properties by region and amenities. The third step would provide more details on a property and its venues. We resisted the obvious choice of simply updating the "look and feel" of the McMenamins site. We instead opted to renovate the user experience for event hosts. Keeping their needs at the forefront helped us identify the right content, structure, and layout for this site. Then, we were able to connect a new a visual design to elevate that functionality. With designs in place, we also developed a customized content management system (CMS) to power these pages. This gives the McMenamins staff flexibility to update content and imagery. 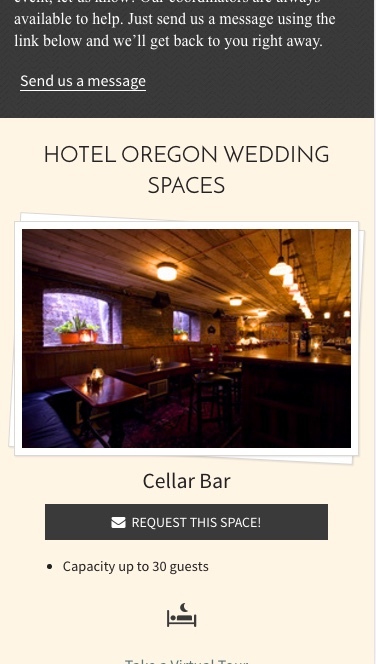 This new workflow gives McMenamins a chance to showcase their properties all at once, with property-specific photography and content targeted to the user's needs. It has also increased their sales efficiency, as people can now call or email with specific venues in mind.